University President Morton Schapiro addresses new students during March Through the Arch on Sept. 13. 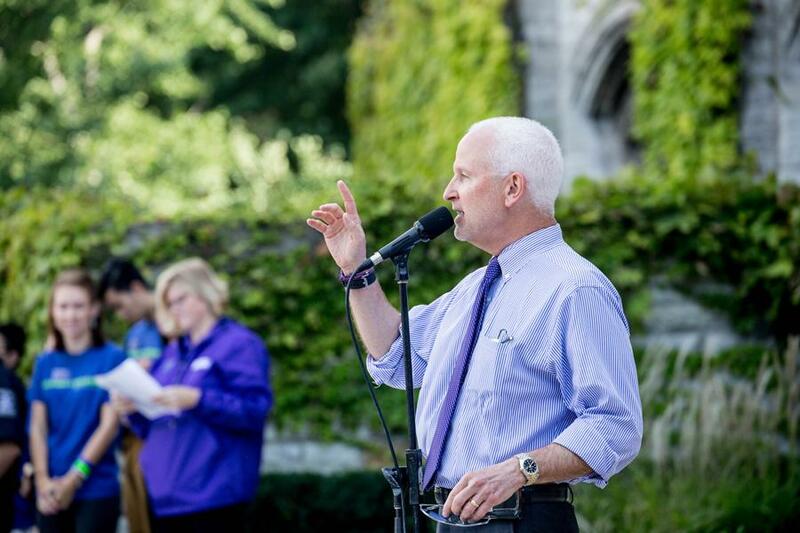 Schapiro spoke to new students on Monday at Welsh-Ryan Arena, condemning critics of safe spaces and trigger warnings. During a speech to new students Monday, University President Morton Schapiro blasted critics of safe spaces and trigger warnings on college campuses. During his convocation speech on Monday at Welsh-Ryan Arena, Schapiro said students are likely to feel uncomfortable at Northwestern. But he said they deserve a space where they can let their guard down — whether it’s a musical group, religious center or the Black House. Schapiro acknowledged the ongoing debate about college students being “coddled” and not resilient enough. Calling people who deny the existence of microaggressions “idiots,” Schapiro said he clearly remembers every microaggression he has experienced. Microaggressions “cut you to the core” and aren’t easily forgotten, he said. Schapiro also criticized those who “conflate” the use of trigger warnings with undermining the First Amendment, saying students should be warned about potentially traumatic content, such as the Holocaust or lynching of black people. “If they say that … you shouldn’t be warned to prepare yourself psychologically for that, that somehow that’s coddling, those people are lunatics,” Schapiro said. Schapiro’s speech follows controversy at the University of Chicago, where a letter from the dean of students told freshmen the University does not support safe spaces and trigger warnings. Amid the blowback, Schapiro co-wrote an op-ed in the Los Angeles Times, saying protests on college campuses are a sign of progress toward diversity and inclusion. Weinberg freshman Sayeed Sanchez said he disagrees that college students are becoming too sensitive. Sanchez, who identifies as queer and a person of color, said he felt Schapiro’s speech spoke to his fears about attending NU. Medill freshman Matthew Casler said he read Schapiro’s op-eds and agrees with his perspective on safe spaces and trigger warnings. Casler added that spaces such as the Black House are particularly important in light of the University report on the black student experience sent out Monday. The 150-page report found many black students feel unwelcome or unsupported at NU. During his speech, Schapiro said students have to feel safe before they can get out of their comfort zone and participate in uncomfortable learning.